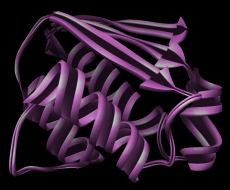 Secondary structure ribbons for peptides, proteins, and nucleic acids can be displayed using the command ribbon or the Actions menu. Which style of ribbon is shown can be controlled with the command ribrepr or the Actions menu. The scaling of a ribbon is its secondary-structure-specific height and width. 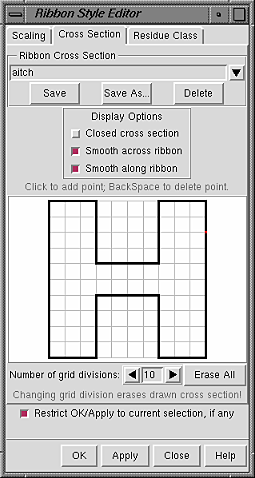 In the Scaling panel of the Ribbon Style Editor, changes can be entered directly, or the arrows on either side of a field can be clicked to increase or decrease the value by 0.05-angstrom increments. Only values greater than zero are allowed. Changes will not take effect until either Apply or OK is clicked; OK also dismisses the panel. Restrict OK/Apply... allows the scaling to be applied to only the current selection. If a ribbon were to be laid out on a flat surface, the Width is the dimension parallel to the surface but perpendicular to the long axis of the ribbon, and the Height is the dimension perpendicular to the surface. Height settings only affect styles with a thickness (the built-in flat style is only affected by changes in Width). Nucleic acid structures are shown with the Nucleic ribbon. For proteins, Helix and Sheet assignments are taken from the input structure file or generated with ksdssp; the remainder is shown as Turn. Strands (the Sheet segments) are shown by default as arrows pointing in the C-terminal direction. Setting the Arrow (tip) and Arrow (base) widths the same as the Sheet width turns off the arrow appearance. Setting the Arrow tip and base widths equal to the Turn width also turns off the arrow appearance but shortens the strand somewhat. Setting all the widths equally small generates a simple spaghetti-like representation. The style of a ribbon is defined by its cross section (general shape perpendicular to the long axis) and how the cross section is smoothed. Changes will not take effect until either Apply or OK is clicked; OK also dismisses the panel. Restrict OK/Apply... allows the style to be applied to only the current selection. Named styles are saved in the Chimera preferences file, and are only updated with any changes when Save, Save As..., or Delete is used. User-defined styles can be accessed with the command ribrepr and the Actions menu. The settings in effect when a session is saved (whether or not the style has a name) are included in the session file. There is also a nucleic acid rotated class, which differs from the nucleic acid class only in that the option to rotate the ribbon is on. Changes will not take effect until either Apply or OK is clicked; OK also dismisses the panel. Restrict OK/Apply... allows the changes to be applied to only the current selection.